A friend of mine who is more familiar than I with the gambling biz was IM’ing me today and we were sorting out the winning odds of certain card games. 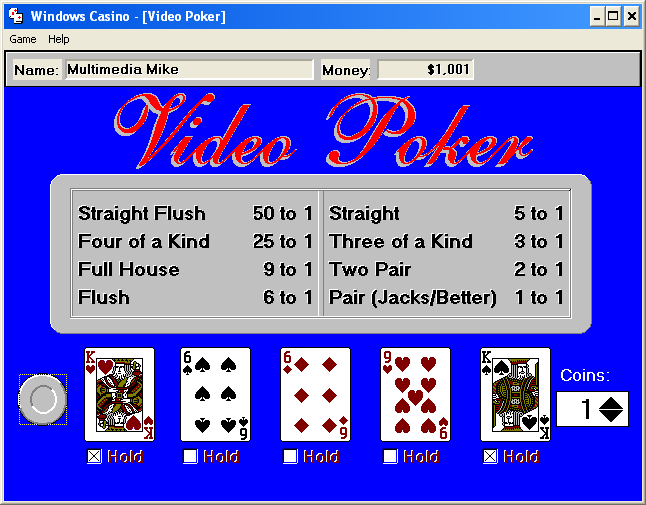 I decided to check the big list of unprocessed games in my care and found one “maybe” game that perhaps qualifies for inclusion into the MobyGames database: Video Casino Games. I think it was probably some kind of commercial game. The CD lists a lot of instructions, and even a phone number for support. Put it in and see what happens. Just like last night’s game, I’m moving out of my comfort zone, genre-wise. Further, I suspect that this will serve as my baseline for gambling games. The game CD lists the supported OSes as Windows 3.1 and 95. During installation, I can see Visual Basic runtime files being copied over. Okay, no big deal– I’m sure it’s possible to write a halfway decent game in VB. I have yet to play such a game, but I’m not ruling it out. The game seems to think I am running Windows 3.95, which is interesting. ‘ver’ from the Windows command prompt reports 5.1.2600, but as long as the game deems the revision high enough to run, no matter. The custom dialog boxes are not modal (but the stock system alert-style dialogs are). Windows aren’t sized properly when you enter a particular game, leaving you quite confused if you have less than a passing familiarity with the most basic gambling setups. Quitting the app does not prompt for verification. The help button doesn’t always work. Though, by the time this happened, the program was in an incredibly weird state in which I probably could have broken the bank. 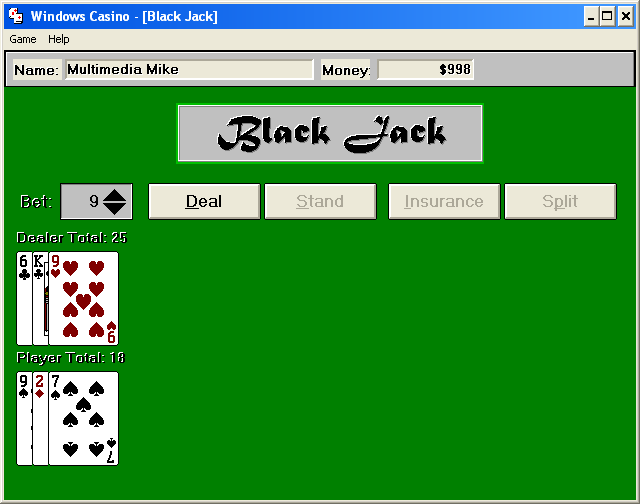 So let’s start with Blackjack, the only game I understand, partially. It’s pretty straightforward, as long as you are cognizant to stretch the window out sideways to get the whole table in view. I appreciate that the game counts on my behalf, further lessening the amount of brainpower I have to expend. Let’s proceed to Roulette. 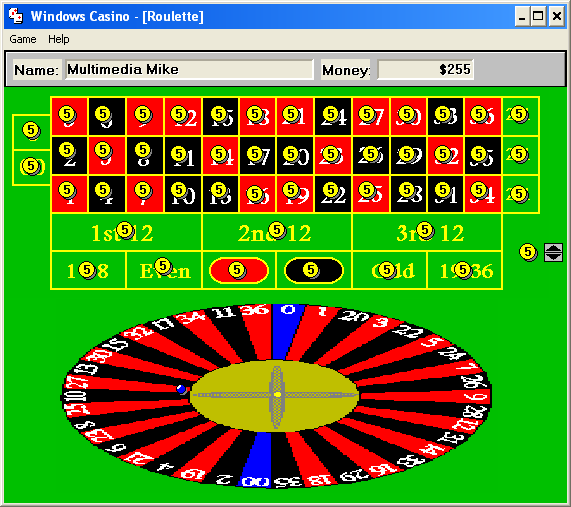 Now, the roulette wheel on the title screen is drawn reflecting the aspect ratio of the window area it is allotted. This can lead to properly round wheels under the right circumstances. I figured the same would hold true for the main wheel, but no. You get the weird shape no matter what. I think it’s supposed to be some crude 3D simulation. So, the thrust of Roulette, per my limited understanding, is to bet money on the odds that the ball with land on a particular number. You can wager more generally on, say, black or red, but the payoff isn’t as high. In this video representation, you raise or lower the number on your chip icon, then click where you would like to bet. Click on the wheel to affect an instantaneous spin. There isn’t any satisfying feedback here, just a summary result. I figured this was all pretty silly until I won $1750 on a $50 bet after a few tries. I’m primed for Vegas now! I was trying to deplete all of my money. I was down to $5 so I placed a $5 bet. But I still had $5. So I placed another. By now, my available cash meter read $15. I placed $5 everywhere on the board to drive the total up to $225. I fully expected the program to have a catastropic meltdown when I “spun” the wheel, but nothing really happened. I was able to back out to the main screen with my $225. I’m so unclear on gambling games that the above scenario might actually be what happens at a typical roulette table when a gambler is down on his luck. But let’s move swiftly over the the Craps table. This table uses the same circular pictorial representation for chips, with a number drawn on top for amount. In may interest you to know that $99 is the maximum wager when these chips are involved. Why? Because the program is only set up to draw 2 digits on a chip. The instructions state as much. 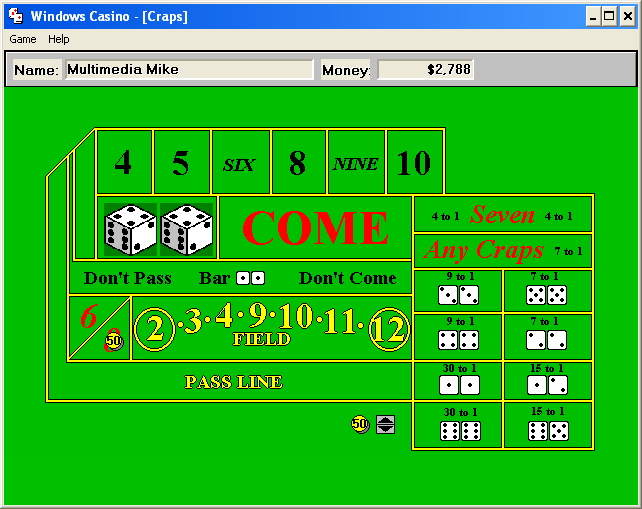 The craps board is just as confusing to me. I just keep clicking in places until something happens. It turns out that I can place bets in a number of the delineated areas, with similar types of risk/reward payoff ratios present at the Roulette table. Click on the dice to generate an instant gratification roll. Here’s another odd characteristic of this game that I am not confident reflects reality: While I would normally lose money if the dice roll did not have something to do with my selected wager, in the above screenshot, I placed a $50 bet on “big 8”. Then I continually rolled the dice until I got an 8. I never lost money through all these dice rolls, but would win $50 more every time 8 came up. I tend to doubt that’s how it works in the real world. If I’m wrong, do please tell me as I would like to speedily exploit this heretofore unknown get-rich-quick scheme. For further weirdness (bugginess? ), when I placed a $95 bet in the same situation, the payoff would be $105 each time. This game could have used some visual cue to indicate when a round was over. Audio cues would have been even better. But this is such an early game that it was probably unreasonable to expect sound cards as standard issue yet. Final analysis: I think this game has made me an even worse liability to myself if I were to actually enter a casino. Update: The gambler has confirmed for me that the Craps quirks actually have some basis in reality, though I don’t pretend to understand all the rules.